Department of Dermatology, Faculty of Medicine, al-Minya University, al-Minya, Egypt. Tumor necrosis factor-related apoptosis-inducing ligand (TRAIL) is a member of the tumor necrosis factor superfamily, and has been implicated in the regulation of various physiological and pathological immune responses. The present study aims to study TRAIL expression in skin lesions and non-lesional skin of patients with atopic dermatitis (AD) as well as in lichen simplex chronicus and in normal control skin. The study has been conducted on 49 patients with atopic dermatitis, 3 cases were acute, 15 cases were subacute, 28 cases were chronic and 3 cases were lichen simplex chronicus. Two skin biopsies were obtained from all patients; one from lesional skin and the other from the apparently normal non-lesional skin. Skin biopsies were also obtained from 3 normal volunteers. 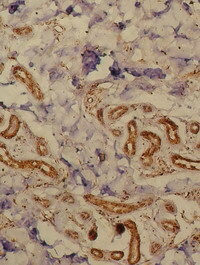 Immunohistochemical staining technique was performed to demonstrate TRAIL expression in skin samples of patients and controls. 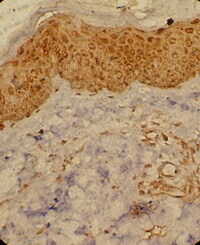 In the cells of the dermal infiltrate the expression of TRAIL was the higher in acute lesions (80 cells ± 4/H.P.F.) than subacute (25cells±5/H.P.F.) and chronic lesions (20 cells ± 2/H.P.F.) and the differences were highly significant (p=<0.0001 for both). The expression in non-lesional skin (50 cells ± 5/H.P.F.) was significantly lower than acute lesions and lichen simplex ((p=<0.0001 and =0.045 respectively), significantly higher than subacute and chronic lesions (p=0.037 and =0.014 respectively) but was not statistically different from normal controls. In conclusion, the expression of TRAIL in skin of patients with AD differs according to the stage of the disease. To better understand its functions, we suggest that TRAIL expression studies should be performed in other diseases and controlled following pharmacological treatment. 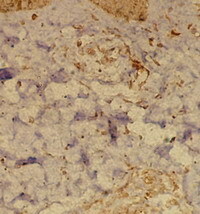 The present study aims to study tumor necrosis factor-related apoptosis-inducing ligand (TRAIL) expression in acute, subacute and chronic skin lesions as well as in non-lesional skin of patients with atopic dermatitis as well as in normal control skin samples for more understanding of the pathogenesis of this disease. The present study has been conducted on 49 patients with atopic dermatitis, attending the Dermatology outpatient clinic of Al-Minya University Hospital. Twenty-four patients (49%) were males and 25 (51%) were females. The age of patients ranged from 1 year to 35 years with a mean age and Standard Deviation (SD) of 9.1 ± 7.3 years. All patients satisfied the UK Working Party's refinement of the diagnostic criteria of the Hanifin and Rajka for atopic dermatitis. Of all patients included three cases (6.1%) were acute, 15 cases (30.6%) were subacute, 28 cases (57.1%) were chronic and 3 cases (6.1%) were lichen simplex chronicus. Patients received no topical or systemic treatment for at least 1 month before biopsy taking. Skin biopsies were obtained from all patients using sterile 4 mm punches after taking informed consents. Two biopsies were taken; one from lesional skin and the other from the apparently normal non-lesional skin. Each biopsy was immediately fixed in 10% formalin, embedded in a paraffin block and sectioned into 5 µm thick sections. These sections were utilized for routine haematoxylin and eosin (H&E) as well as for immunohistochemical staining. Skin biopsies were also obtained from 3 normal control persons and have been subjected to the same embedding and staining procedures as for patient biopsies. 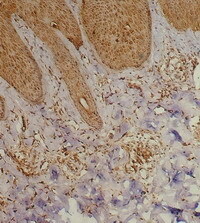 Immunohistochemical staining technique was performed to demonstrate TRAIL expression in skin samples of patients and controls. A ready-to-use detection system (lab EnVision + System, Peroxidase (DAB), lab vision®, Cat# TP-015-HD) was used. The primary antibody was the monoclonal mouse anti-human TRAIL /TNFSF10 antibody (R&D system Corporation®, Cat# 375). It was used in a dilution of 25µg/ml. The expression of TRAIL in the cells of the dermal infiltrate was evaluated according to the number of positively stained cells/H.P.F. (Table 1). 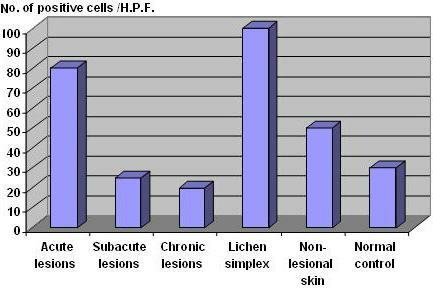 Score Number of positive cells/ H.P.F. Table 1: Scoring system for quantifying TRAIL expression in the cells of the dermal infiltrate. Data were collected and tabulated using Excel Software. Statistical analysis was done using SPSS (version 11.0). The numerical data was expressed as mean ± standard deviation (SD). T-student test was used to compare numerical values. The (t-test) values were expressed in terms of p-value. P value was considered significant when it is < 0.05 and highly significant when it is < 0.001. TRAIL was noticed to be expressed mainly in the cells of the dermal infiltrate. In addition, some degree of expression was also noticed in vessel wall, endothelial cells, fibroblasts as well as periappendageal. The expression of TRAIL was found to be much higher in the cells of the dermal infiltrate in acute than subacute or chronic cases. In acute cases, the mean TRAIL expression was found to be 80 cells ± 4/H.P.F. (score 4) (Fig.2). This expression was noticed to decline to 25 cells ± 5/H.P.F (score 1-2) in subacute cases (Fig.3). This decline is statistically highly significant (p=<0.0001). The mean TRAIL expression also declined to reach 20 cells ± 2/H.P.F (score 1) in chronic cases (Fig.4). This decline is also statistically highly significant (p=<0.0001). Fig 1: TRAIL expression in the dermal infiltrate of acute, subacute and chronic lesions of AD, lichen simplex chronicus as well as in non-lesional skin and normal controls. Fig 2: Acute atopic skin lesion showing marked TRAIL expression in the dermal infiltrate as well as in epidermal cells, periappandageal, perivascular and endothelial cells (Immunoperoxidase; X200). 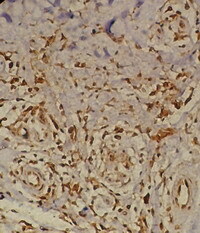 Fig 3: Subacute atopic skin lesion showing moderate TRAIL expression in the dermal infiltrate as well as in epidermal cells, periappandageal, perivascular and endothelial cells (Immunoperoxidase; X200). Fig 4: Chronic atopic skin lesion showing mild TRAIL expression in the dermal infiltrate as well as in epidermal cells, periappandageal, perivascular and endothelial cells (Immunoperoxidase; X200). Biopsies obtained from patients with lichen simplex showed high expression of TRAIL (100 cells ± 24/H.P.F; score 4-5) in the dermal infiltrate (Fig.5). Although this expression was not statistically different from that observed in acute lesions (p=0.2), it was much higher than that noticed in subacute and chronic skin lesions as well as non-lesional skin and this difference is statistically highly significant (p=<0.0001). 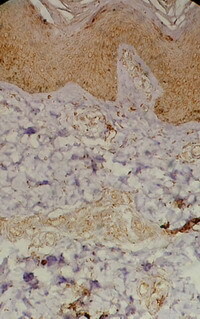 Fig 5: Lichen simplex lesion showing TRAIL expression in the dermal infiltrate as well as in epidermal cells, periappandageal, perivascular, endothelial cells and fibroblasts (Immunoperoxidase; X100). Biopsies obtained from non-lesional skin of patients with AD showed moderate level (50 cells ± 5/ H.P.F; score 3) of TRAIL expression in the dermal infiltrate (Fig.6). The level of expression was lower than that observed in the acute lesions of AD and this difference was statistically highly significant (p=<0.0001). 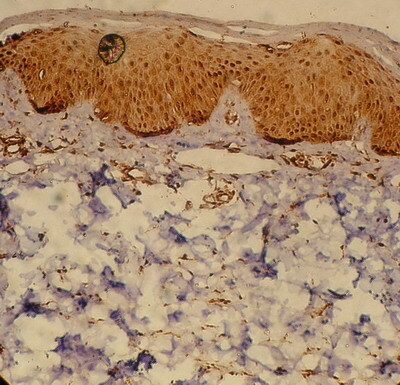 Fig 6: Non-lesional skin of an atopic patient showing moderate TRAIL expression in the epidermis with mild expression in the dermal inflammatory infiltrate (Immunoperoxidase; X200). Biopsies obtained from normal control subjects also showed moderate level (30 cells ± 5/ H.P.F. ; score 3) of the TRAIL expression in dermal infiltrate (Fig.7). The expression was lower than that observed in acute lesions of AD as well as in non-lesional skin and this difference was statistically highly significant (p=0.0001 for both). To the contrary, TRAIL expression in the skin samples of normal controls was higher than that observed in chronic skin lesions of AD and this difference was statistically highly significant (p=0.0001). However, when compared with that observed in subacute lesions, the expression was not statistically different (p=0.12). 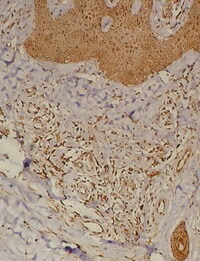 Fig 7: Skin from a normal control subject showing marked TRAIL expression in the epidermis with mild expression in the dermal cells (Immunoperoxidase; X200). Table 2: TRAIL expression in dermal infiltrate of lesional and non-lesional skin of patients with AD, lichen simplex chronicus and in normal controls. In spite of the recent progress in the field, the physiological role of TRAIL remains to be determined. TRAIL has been shown to be critical in the regulation of the immune response. It induces apoptosis in dendritic cells, regulating adaptive immune response, and it mediates apoptosis in neutrophils, [18,22,23] suggesting that it also controls innate immune responses. In addition, TRAIL also exerts anti-inflammatory activities. [22,23,30,31,32,33,34,37,38,39,40]. An understanding of the immunologic basis of AD may have important implications for clinical management of the disease. The present study aims to study TRAIL expression in lesional as well as in non-lesional skin of patients with atopic dermatitis and comparing it with normal control samples for more understanding of the pathogenesis and immunologic basis of this disease. In the present study, the expression of TRAIL in the cells of the dermal infiltrate was observed to be significantly higher in acute than in subacute (p=<0.0001) or chronic skin lesion (p=<0.0001) of patients with AD. In addition, the level of expression in acute lesions was also higher than that observed in non-lesional skin (p=<0.0001) of patients with AD as well as in normal control skin (p=0.0001). These findings are consistent with previous reports. TRAIL-positive mononuclear cells were present in greater numbers in lesional skin of patients with AD compared with non-lesional skin and normal controls. The results of the present study also show that the non-lesional skin of patients with AD expresses a moderate level of TRAIL in cells of the dermal inflammatory infiltrate. TRAIL expression in cells of the dermal inflammatory infiltrate in non-lesional skin was significantly lower that observed in acute lesions (p==<0.0001) but significantly more than that observed in subacute and chronic skin lesions as well as in normal control skin. This observation suggests that the apparently normal skin of patients with AD harbour some immunohistochemical abnormalities regarding TRAIL expression with more than normal expression in dermal inflammatory infiltrate. Thus we suggest adding a new finding to the list of abnormalities previously reported  in the apparently normal skin of patients with AD. In patients with lichen simplex, skin biopsies showed expression of TRAIL in the cells of the dermal infiltrate, which was not significantly different from that observed in acute skin lesions of AD (p=0.2). However, the level of expression was significantly higher than that seen in subacute lesions (p=<0.0001), chronic lesions (p=<0.0001), non-lesional skin (p=<0.0001) as well as normal control subjects (p=0.007). To the best of our knowledge, TRAIL expression was not previously studied in the lesions of lichen simplex chronicus. We suggest that the persistence of inflammation in such persistent and chronic lesions may be responsible for the continued expression of TRAIL by the infiltrating cells as well as by the local tissue in an attempt to terminate such chronic inflammatory process. In addition, we suggest considering this highly significant difference (p=<0.0001) in TRAIL expression in lesions of lichen simplex chronicus as a point of immunohistochemical differentiation between this type of eczema and the ordinary chronic skin lesions of AD. In conclusion, the expression of TRAIL in skin of patients with AD differs according to the stage of the disease, being the highest in the acute stage then declines thereafter. Non-lesional skin of patients with AD is abnormal regarding TRAIL expression with more than normal expression in dermal inflammatory infiltrate. The lower than normal TRAIL expression in the ordinary chronic skin lesions of AD helps to differentiate them from those of lichen simplex chronicus. To better understand its functions, we suggest that TRAIL expression studies should be performed in other diseases and controlled following pharmacological treatment. 1. Leung DYM, Bieber T. Atopic dermatitis. Lancet 2003; 361: 151- 160. 2. Boguniewicz M, Leung YMD. Atopic dermatitis. J Allergy Clin Immunol 2006; 117: S475- 80. 3. Braathen LR, Fo¨rre O, Natvig JB, Eeg-Larsen T. Predominance of T lymphocytes in the dermal infiltrate of atopic dermatitis. Br J Dermatol 1979; 100: 511- 519. 4. Leung DYM, Bhan AK, Schneeberger EE, Geha RS. Characterization of the mononuclear cell infiltrate in atopic dermatitis using monoclonal antibodies. J Allergy Clin Immunol 1983; 71: 47- 56. 5. Akdis CA, Akdis M, Simon D, et al. T cells and T cell-derived cytokines as pathogenic factors in the nonallergic form of atopic dermatitis. J Invest Dermatol 1999; 113: 628- 634. 6. Hamid Q, Boguniewicz M, Leung DYM. Differential in situ cytokine expression in acute versus chronic atopic dermatitis. J Clin Invest 1994; 94: 870- 876. 7. Hamid Q, Naseer T, Minshall EM, Song YL, Boguniewicz M, Leung DYM. In vivo expression of IL-12 and IL-13 in atopic dermatitis. J Allergy Clin Immunol 1996; 98: 225- 231. 8. Grewe M, Gyufko K, Schopf E, Krutmann J. Lesional expression of interferon gamma in atopic eczema. Lancet 1994; 343: 25- 26. 9. Trautmann A, Akdis M, Kleemann D, et al. T cell-mediated Fas-induced keratinocyte apoptosis plays a key pathogenetic role in eczematous dermatitis. J Clin Invest 2000; 106: 25- 35. 10. Kimberley FC, Screaton GR. Following a TRAIL: Update on a ligand and its five receptors. Cell Res 2004; 14: 359- 372. 11. Mariani SM, Krammer PH. Surface expression of TRAIL/Apo-2 ligand in activated mouse T and B cells. Eur J Immunol 1998; 28: 1492- 1498. 12. Thomas WD, Hersey P. TNF-related apoptosis-inducing ligand (TRAIL) induces apoptosis in Fas ligand-resistant melanoma cells and mediates CD4 Tcell killing of target cells. J Immunol 1998; 161: 2195- 2200. 13. Kayagaki N, Yamaguchi N, Nakayama M, Eto H, Okumura K, Yagita H. Type I interferons (IFNs) regulate tumor necrosis factor-related apoptosis-inducing ligand (TRAIL) expression on human T cells: A novel mechanism for the antitumor effects of type I IFNs. J Exp Med 1999; 189: 1451- 1460. 14. Mirandola P, Ponti C, Gobbi G, et al. Activated human NK and CD8T cells express both TNF-related apoptosis-inducing ligand (TRAIL) and TRAIL receptors but are resistant to TRAIL-mediated cytotoxicity. Blood 2004; 104: 2418- 2424. 15. Kemp TJ, Moore JM, Griffith TS. Human B cells express functional TRAIL/Apo-2 ligand after CpG-containing oligodeoxynucleotide stimulation. J Immunol 2004; 173: 892- 899. 16. Griffith TS, Wiley SR, Kubin MZ, Sedger LM, Maliszewski CR, Fanger NA. Monocyte- mediated tumoricidal activity via the tumor necrosis factor-related cytokine, TRAIL. J Exp Med 1999; 189: 1343- 1354. 17. Halaas O, Liabakk NB, Vik R, Beninati C, Henneke P, Sundan A, Espevik T. Monocytes stimulated with group B streptococci or interferons release tumour necrosis factor-related apoptosis-inducing ligand. Scand J Immunol 2004; 60: 74- 81. 18. Tecchio C, Huber V, Scapini P, et al. IFNalpha-stimulated neutrophils and monocytes release a soluble form of TNF-related apoptosis-inducing ligand (TRAIL/Apo-2 ligand) displaying apoptotic activity on leukemic cells. Blood 2004; 103: 3837- 3844. 19. Fanger NA, Maliszewski CR, Schooley K, Griffith TS. Human dendritic cells mediate cellular apoptosis via tumor necrosis factor-related apoptosis-inducing ligand (TRAIL). J Exp Med 1999; 190: 1155- 1164. 20. Zamai L, Ahmad M, Bennett IM, Azzoni L, Alnemri ES, Perussia B. Natural killer (NK) cell-mediated cytotoxicity: Differential use of TRAIL and Fas ligand by immature and mature primary human NK cells. J Exp Med 1998; 188: 2375- 2380. 21. Kayagaki N, Yamaguchi N, Nakayama M, et al. Expression and function of TNFrelated apoptosis-inducing ligand on murine activated NK cells. J Immunol 1999; 163: 1906- 1913. 22. Renshaw SA, Parmar JS, Singleton V, et al. Acceleration of human neutrophil apoptosis by TRAIL. J Immunol 2003; 170: 1027- 1033. 23. Matsuyama W, Yamamoto M, Higashimoto I, et al. TNF-related apoptosis-inducing ligand is involved in neutropenia of systemic lupus erythematosus. Blood 2004; 104: 184- 191. 24. Daniel PT, Wieder T, Sturm I & Schulze-Osthoff K. The kiss of death: Promises and failures of death receptors and ligands in cancer therapy. Leukemia 2001; 15: 1022- 1032. 25. Griffith TS, Lynch DH. TRAIL: a molecule with multiple receptors and control mechanisms. Curr Opin Immunol. 1998; 10: 559- 63. 26. Ashkenazi A, Dixit V. Apoptosis control by death and decoy receptors. Curr Opin Cell Biol 1999; 11: 255- 60. 27. Ashkenazi A, Pai RC, Fong S, et al. Safety and antitumor activity of recombinant soluble Apo2 ligand. J Clin Invest 1999; 104: 155- 162. 28. Walczak H, Miller RE, Ariail K, et al. Tumoricidal activity of tumor necrosis factor-related apoptosis-inducing ligand in vivo. Nat Med 1999; 5: 157- 163. 29. 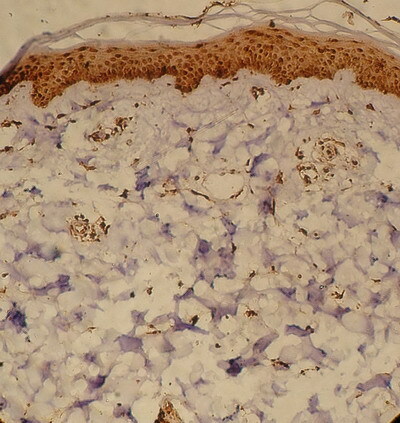 Stander S, Schwarz T. Tumor necrosis factor-related apoptosis-inducing ligand (TRAIL) is expressed in normal skin and cutaneous inflammatory diseases, but not in chronically UV-exposed skin and non-melanoma skin cancer. Am J Dermatopathol. 2005; 27(2): 116-21. 30. Jo M, Kim TH, Seol DW, Esplen JE, Dorko K, Billiar TR, Strom SC. Apoptosis induced in normal human hepatocytes by tumor necrosis factor-related apoptosis-inducing ligand. Nat Med 2000; 6: 564- 567. 31. Zheng SJ, Wang P, Tsabary G, Chen YH. Critical roles of TRAIL in hepatic cell death and hepatic inflammation. J Clin Invest 2004; 113: 58- 64. 32. Miura Y, Misawa N, Maeda N, et al. Critical contribution of tumor necrosis factor related apoptosis-inducing ligand (TRAIL) to apoptosis of human CD4 T cells in HIV-1-infected hu-PBL-NOD-SCID mice. J Exp Med 2001; 193: 651- 660. 33. Ursini-Siegel J, Zhang W, Altmeyer A, Hatada EN, Do RK, Yagita H, Chen-Kiang S. TRAIL/Apo-2 ligand induces primary plasma cell apoptosis. J Immunol 2002; 169: 4739- 4744. 34. Leverkus M, Walczak H, McLellan A, Fries HW, Terbeck G, Brocker EB, Kampgen E. Maturation of dendritic cells leads to up-regulation of cellular FLICEinhibitory protein and concomitant down-regulation of death ligand-mediated apoptosis. Blood 2000; 96: 2628- 2631. 35. Kamohara H, Matsuyama W, Shimozato O, Abe K, Galligan C, Hashimoto S, Matsushima K, Yoshimura T. Regulation of tumour necrosis factor-related apoptosis-inducing ligand (TRAIL) and TRAIL receptor expression in human neutrophils. Immunology 2004; 111(2): 186- 194. 36. Kefei, K. A. M. Poster; Susan, T. N.; Seth, R. S. and Kevin, D. C. (): Atopic dermatitis. Papulosquamous and eczematous dermatoses. In: Dermatology. Bolognia JL, Jorizzo JL, Rapini RP (eds), Mosby. 2006; P199. 37. Song K, Chen Y, Goke R, et al. Tumor necrosis factor-related apoptosis-inducing ligand (TRAIL) is an inhibitor of autoimmune inflammation and cell cycle progression. J Exp Med 2000; 191: 1095- 1103. 38. Daigle I, Yousefi S, Colonna M, Green DR, Simon HU. Death receptors bind SHP-1 and block cytokine-induced anti-apoptotic signaling in neutrophils. Nat Med 2002; 8: 61- 67. 39. Vassina, E, Martin L, Shida Y, Lasse RB, Hans-Uwe S, Dagmar S. Increased expression and a potential anti-Inflammatory role of TRAIL in AD. J Invest Dermatol 2005; 125: 746 -752. 40. Arend WP. The balance between IL-1 and IL-1Ra in disease. Cytokine Growth Factor. Rev 2002; 13: 323- 340. 41. Leung DYM, Soter NA. Cellular and immunologic mechanisms in atopic dermatitis. J Am Acad Dermatol 2001; 44: S1- 12.